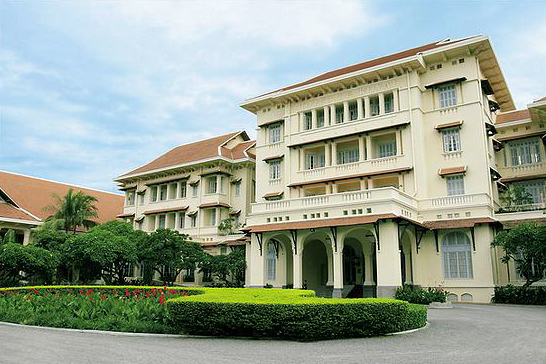 Raffles Hotel Le Royal is the premier hotel in Phnom Penh, a hotel with those rare attributes of history and style. It was first established in 1929, and in its early heyday enjoyed an international clientele comprising globetrotters and adventurers, writers and journalists, royalty and dignitaries. Reopened in 1997, after a careful restoration and refurbishment program by Raffles International, the grand historic hotel fulfills all the requirements of a modern world-class hotel with its facilities and amenities, but imparts an old-world charm through its style and decor, which is elegant yet comfortable, classic yet casual. Raffles Hotel Le Royal offers 170 guest rooms, suites and executive apartments, each tastefully appointed with Cambodian-style furnishings and objects d'art. The rooms are spread over three separate but interconnecting low-rise wings, set around the garden courtyard and swimming pools. The main building has been beautifully restored and refurbished to its original architectural style. State Rooms, located in the new low-rise wings for the hotel, offer guests a choice of views, overlooking either the hotel’s two pools or the lush landscaping around the wing blocks. Landmark Rooms, located in the main building, are furnished with a luxurious blend of Cambodian and art deco themes. The rooms are decorated with memorabilia and artifacts reminiscent of the Golden Age of Travel. Studio Suites were created for a more residential feel to cater to longer-staying guests. Fitted with an in-room stereo system, the suites come with specially designed workstations and full pantry facilities. Landmark Suites located in the main building, are the deluxe suites of the hotel, each suite comprises a spacious living room and bedroom with sleigh bed and is decorated in original antiques and artwork. The bathroom also comes with an original claw-footed bathtub and a private balcony. These suites have names that have been chosen in honour of Cambodia's ancient history: Chenla Suite, Angkor Suite, Khmer Suite and Kambaya Suite. Personality Suites take their direction from people who have had a close link with the hotel. They are named after, Jacqueline Kennedy, Somerset Maugham, Charles de Gaulle and Andre Malraux. Le Royal Suite, which is the hotel's premier suite, is located on the 4th storey, overlooking the lush gardens at the front of the hotel. It is luxuriously appointed with Cambodian and French furnishings and has two bedrooms, a dining room, a large living room and a fully equipped pantry. Restaurant Le Royal - offers a wide selection of modern French and Royal Cambodian cuisine in a refined and elegant atmosphere and is patronized by the who’s who of Phnom Penh. Café Monivong - the perfect place to relax and linger over our delicious Western and Asian cuisine buffet style and a la carte menu. Le Phnom Deli – serves a variety of pastries and refreshments for eating in or taking away. Poolside Terrace – offers drinks and light snacks throughout the day including a specialty ice tea menu. Elephant Bar – serves original cocktails and a wide selection of premium spirits in a sophisticated and charming atmosphere. Writer's Bar - a relaxed bar where guests can spend a quiet afternoon. Here you'll find Raffles Hotel Le Royal's signature cocktails, other beverages and local snacks. Private Dining Room- for an intimate dinner or meeting our private dining room which seats 12 guests embodies the very essence of Cambodian charm and timeless civilized style. RafflesAmrita Spa includes a fully equipped gym, saunas, a Jacuzzi, steam and massage rooms. Raffles Hotel Le Royal has two ballrooms and other meeting, banqueting and private dining facilities. The well-trained team of professionals offers personalized service with a difference: a difference that offers sophistication and efficiency. For meetings and conferences, audio-visual equipment, display easel and white board, portable platform / stage, lectern and LCD monitor are available. Located in the heart of Phnom Penh, Raffles Hotel Le Royal is only 20 minutes' drive from Pochentong International Airport and within easy access of the city's attractions such as the Royal Palace, Central Market, Russian Market and the National Artifacts Museum.